If you follow Zotero on Twitter, Jason Puckett‘s name may already be familiar to you. Below is our inaugural Spotlight interview with Jason, Zotero evangelist and author of a new book on Zotero published this month. Jason Puckett, Communication Librarian, Georgia State University. For about five years now. I used to teach and use Endnote, but tried out Zotero while in library school and quickly became a convert. How do you teach and promote Zotero? Basically, I’m the point of first contact for anyone at GSU who needs help learning Zotero. I teach regular in-person workshops during the academic year. I usually include at least a brief Zotero segment in most of my regular course-based information literacy classes. I’ve taught online workshops using Elluminate and other presentation software, for GSU and as a guest speaker for other institutions. I’ve also taught a four-week online continuing education course for librarians for Simmons Graduate School of Library and Information Science, using Moodle. What are some projects you’ve done using Zotero? I’m the author of the new book Zotero: A Guide for Librarians, Researchers and Educators from ACRL Publications. It goes into the basic and advanced functionality of Zotero, and even has some information on including feeds in third party apps. Additionally, at GSU Library we recently used a Zotero group to allow several people to work together compiling a bibliography of faculty publications. I’m using it collaboratively to pool sources with an article co-author. And naturally, I’ve used it for every article, bibliography and publication list I’ve created in the last few years. Nothing definite, aside from the paper I’m researching right now. I’m excited to see what happens as the new API allows Zotero to connect with other applications. I’m already trying out the Zotpress plugin on my WordPress site, and it’s working great so far. I’m thinking about a possible digital exhibit I’d like to put together this summer, partly inspired by the New Orleans Research Collaborative site, and I’d certainly use Zotero to build the bibliographies for that. A new third-party plugin called Zotpress is now available. It runs on WordPress, the open source platform widely used for personal, professional and course websites and blogs. Zotpress was created by community member Katie Seaborn, and it allows you to pull and organize items from your or another Zotero library into your WordPress site. The plugin harnesses the power of Zotero’s server API by grabbing library data dynamically and presenting it outside Zotero. So why would you use it? Zotpress is great for scholars or job hunters who want to easily organize their CVs or resumes on their personal websites. Teachers can use it as well to present bibliographies to students. Or, if you just want to share some stuff you’ve been reading or studying, you can use Zotpress for that, too. In short, Zotpress is useful because it expands on Zotero’s mission by offering a new and easy interface to share your data freely with the world. Zotpress has already been downloaded over a thousand times, but please note that it is still under active development, which means you may run into some glitches that will soon be resolved. To download Zotpress or for more information, visit the WordPress plugin directory. 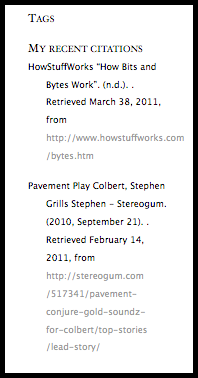 You are currently browsing the Zotero weblog archives for June, 2011.